It's hard to recall a time when legacies weren't an integral part of a charity's marketing mix. But their importance can be traced back to 1987, when the conservation charity WWF-UK had the idea of launching an integrated legacy campaign - the first of its kind in the sector. The Keep It In the Family campaign aimed to raise awareness of legacy giving and the importance of writing a will, as well as raising money for the charity. "We were a smaller organisation at the time and speaking about legacies was difficult," says Sally Burrowes, legacy administration manager at WWF-UK. "The two things that people don't like to talk about are death and money, so combining the two was a challenge. "At that time, people tended to put solicitors on a pedestal and never really questioned legal terms, so they didn't fully understand about wills. This meant that many people were less likely to ask about their options, which is how the idea of 'keeping it in the family' began. We wanted to help people to understand their options in these situations." At the centre of the campaign was a booklet, produced by the charity, that put will-related jargon into lay terms and was sent out in mailshots to supporters. "It made inheritance tax and all the other complicated issues of legacies understandable," says Burrowes. "It also aimed to take away the taboo from the topic." The booklets were also sold to law firms and Citizens Advice Bureaux for distribution. Supporting adverts, inserts and a poster campaign ran alongside the booklet. 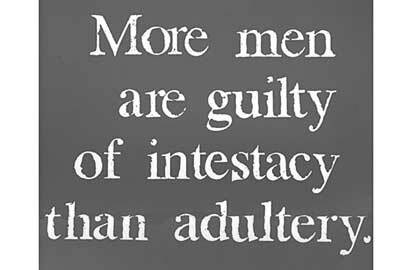 The campaign consisted of three main slogans: "More men are guilty of intestacy than adultery", "More women are victims of intestacy than divorce" and "John promised me I would be secure when he passed away". However, the charity quickly had to drop the third slogan because some people were offended. Despite this small blip, the campaign was a resounding success, says Burrowes. "The agency predicted we would get between 5,000 and 6,000 legacies from the campaign, but in fact we got 48,000," she says. "We kept running out of budget and having to reprint everything because we weren't prepared for the impact that it had." This impact of the campaign went far beyond the WWF, says Burrowes: "It took about six to nine months for other charities to pick up the messaging. After the campaign, it completely changed how people approached legacy marketing. We also learnt to be braver and not shy away from the subject." These simple advertisements changed the face of legacy marketing the world over. I'm not exaggerating - WWF, with its agency Chapter One, led the charity sector in innovation, style and sheer brass neck. Between them, they broke all the rules. Where other charities had discreet Books of Remembrance in their receptions, WWF had a huge wall with names on the leaves of a symbolic tree. Other charities put small adverts in deaths columns; WWF stuck these adverts all over the press. Britain's big charities relied heavily on legacy income, but WWF wasn't a big charity; it was relatively young and, some would say, brash. This campaign made it all right to ask for a legacy with confidence, and the UK's charities have never looked back. Because of this campaign, I believe, the UK leads the world in legacy marketing. Intestacy - you had to be reasonably smart to understand the word. But it was smart people they wanted to persuade.